Strategic thinking is the discipline of noticing and responding to potential game-changers in order to have the advantage even in an uncertain and chaotic business environment. 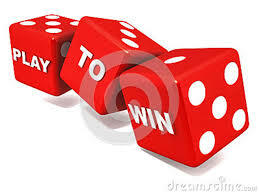 Two essential strategic decisions that must be made in any business are where to play and how to win. Geographically, where shall we play? In which industry segments shall we play? Which customer groups do we want? How will we reach our consumers? What products and services shall we sell? This means that you are also choosing where not to play. You cannot be all things to all people. Even the biggest enterprises must decide to play in certain geographical areas and not others, for certain groups of consumers and not others, and with some products and not others. This gets even harder if you have traditionally played in places and segments where the game is no longer winnable. It really doesn’t matter whether you are thinking about a large organisation, a profit centre or division in that organisation, or a support function. You cannot play every game; you cannot play for every possible fan-base (all customers) and you cannot play on every possible playing field. It is therefore essential to decide how you will target your energy and attention: where do you want to play and where will you not play? Failure to choose will result in scattered focus and ineffective allocation of scarce resources such as cash, people and energy. A low cost strategy: This does not necessarily mean that you are cheaper than anyone else. However, it does mean that you are able to get your product or service to market at a lower cost to yourselves than your competitors can. If you can get your product to market for R40 and sell it at R100, but your competitors can only produce the same item for R50 – and can also only sell it at R100 – you are the cost leader, and you are able to plough the additional margin back into the business. Differentiation: When a differentiation strategy is successful, you are offering your customers products and services that they regard as distinctly more valuable than that of your competitors, and for which they are prepared to pay a premium. This means that each of your products and services offers a specific value proposition to a specific group of customers. You cannot pursue both strategies. You have to choose. In each strategy, your focus is different. In a cost leader strategy, your focus is on understanding what is driving costs and modifying your operations accordingly. You create competitive advantage by having In a differentiation strategy, you are always trying to develop your understanding of your customers in order to offer them something special – and distinctiveness comes at a cost. The application of strategic thinking in this arena is in finding new “how-to-win” choices where none currently exist. If you are pursuing a cost leader strategy, you are always looking at ways to push costs out of the system. 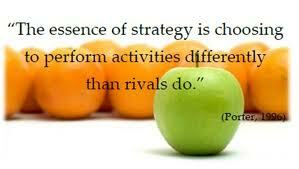 In a differentiation strategy, you are always looking for new and distinctive ways to delight customers. If you cannot create good how to win choices, you should either find a new playing field or get out of the game. Where do I want to play? What do you wish to sell? In which segments of your industry? For whom? Under what conditions? Where do you not want to play? What work do you not want to do (or pursue)? Who do you not wish to do it for? What conditions do you wish to avoid? Will you find new and innovative to get your products / services to market at lower costs than your competitors? How will you do this? How will you ensure that you are constantly searching for ways to strip costs out? Will you pursue a differentiation strategy? What can you do better than any of your competitors? What can you offer your customers that will delight them in ways that your competitors do not? How will you ensure that your offering is always special and distinctive? The ideas for this article come from “Playing to Win” by A.G. Lafley and Roger L. Martin.